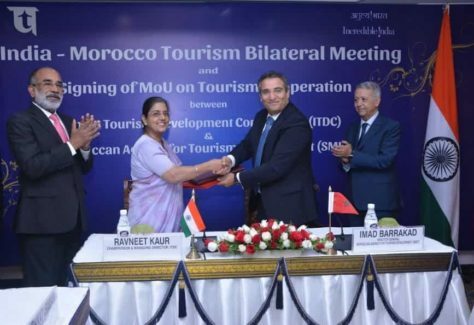 National, 17th September 2018/Team Estrade/– India Tourism Development Corporation Ltd. (ITDC) the public sector undertaking under the aegis of Ministry of Tourism, Government of India today signed a MoU with Moroccan Agency for Tourism Development (SMIT), an autonomous organization under the Ministry of Tourism, Government of Kingdom of Morocco, for strengthening cooperation in the field of tourism. India and Morocco share strong historical, economic and political ties. Signing of the MoU will further strengthen and develop this well-established relationship. The MoU was signed in the presence of K.J. Alphons, Hon’ble Minister of State (Independent Charge) for Tourism, Government of India and Mohammed Sajid, Hon’ble Minister of Tourism, Air Transport, Handicraft and Social Economy, Government of the Kingdom of Morocco by Ravneet Kaur, IAS, Chairperson & Managing Director (C&MD), India Tourism Development Corporation (ITDC) and Imad Barrakad, Chairman and CEO, SMIT at The Ashok, a flagship property of ITDC. Mrs. Rashmi Verma, Secretary to Govt. of India, Ministry of Tourism graced the occasion. Other senior officials from Ministry of Tourism and both the organizations were also present during the signing. With the signing of the MoU, both the organizations will be able to share Engineering and tourism products development expertise; new trends and technology in tourism products and innovative tourism product development; Marketing / Feasibility studies related to the needs and expectations of investors and tourists; Expertise in structuring projects in the infrastructure space apart from sharing of Data base of potential Indian and Moroccan investors in the tourism sector. The organizations will also collaborate to promote tourism investment opportunities through participation in tourism investment events, economic missions and co-organization of promotional investment events which are of mutual benefit. About India Tourism Development Corporation: ITDC was incorporated in 1966 with a mandate to develop and expand tourism infrastructure in the country. The Corporation has been moving ahead with consistent efforts on development, growth and world-class services and amenities to its guests. Apart from running Hotels, the ITDC has diversified into non-hotel sectors like Ticketing, Tours and Travels, Event Management, Duty-Free Shopping, Publicity & Printing Consultancy, Engineering Consultancy, mounting Sound & Light Shows, Hospitality education and skill development– all under one roof.